Hawaiian Holdings stock could be primed for big gains after the Hawaii-focused airline's blowout first quarter earnings report. After several years of struggling to build a defensible international route network, leisure-focused airline operator Hawaiian Holdings (NASDAQ:HA) has become one of the most profitable airlines in the U.S. in the past few years. Hawaiian's pre-tax margin rose from 6.9% in 2014 to 13.2% in 2015, 18.4% in 2016, and 17.6% in 2017. On Tuesday, the Hawaiian Airlines parent reported great results for the first quarter of 2018. Unit revenue trends remain robust, despite tough year-over-year comparisons and rapid industry capacity growth. This is allowing the company to offset most of the headwind from rising fuel costs. Meanwhile, Hawaiian is reaping huge savings from the reduced corporate tax rate. Last month, Hawaiian Holdings significantly improved its first quarter forecast. The company informed investors that revenue per available seat mile (RASM) was on track to rise 3% to 5% year over year in Q1. It had previously expected a modest 1% RASM increase, based on the midpoint of its initial guidance range. Hawaiian Holdings improved its Q1 guidance last month. Image source: Hawaiian Airlines. At the time, I noted that the new guidance implied that Hawaiian was likely to post first quarter EPS of $0.90 to $1.00. Bizarrely, Wall Street analysts' EPS estimates remained much lower, at an average of $0.79. Ultimately, Hawaiian Holdings outperformed even my bullish expectations. Adjusted EPS reached $1.09 in the first quarter, up from $0.98 a year earlier. (Hawaiian originally reported Q1 2017 adjusted EPS of $1.04, but that figure has been restated based on new accounting standards that went into effect this year.) Hawaiian's adjusted pre-tax margin was a solid 11% last quarter. RASM increased 4.9% year over year in Q1, nearly reaching the high end of Hawaiian Airlines' updated guidance range. Meanwhile, adjusted non-fuel unit costs rose 4.3%, which was near the low end of the carrier's most recent guidance range. Hedging gains also helped offset some of the increase in market fuel prices. While Hawaiian posted a very strong adjusted profit last quarter, the carrier did log $35 million of contract termination expenses as a special item. This stems from upcoming changes to the Hawaiian Airlines fleet. First, the carrier terminated the leases for several older Boeing 767s as it prepares to replace them with state-of-the-art Airbus A321neos. Second, the carrier canceled its contract to buy Airbus A330-800neos, opting to switch to the Boeing 787-9 Dreamliner. Despite Hawaiian Airlines' stellar financial performance in recent years, the stock has performed poorly since the beginning of 2017. 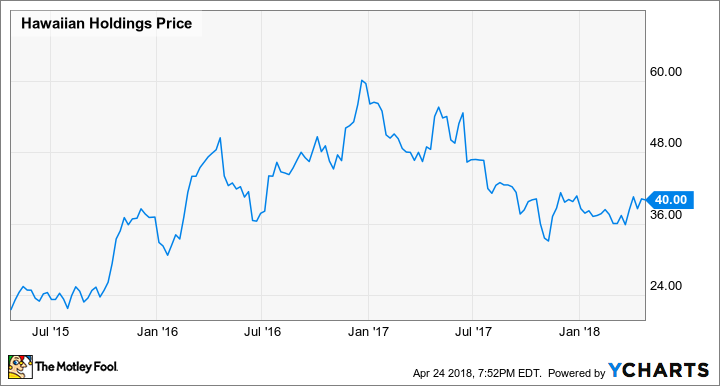 Indeed, Hawaiian Holdings stock has spent most of this year mired below $40: well below the all-time high above $60 that it reached in late 2016. Data source: Hawaiian Holdings Stock Performance, by YCharts. Indeed, Hawaiian Holdings stock trades for less than eight times 2018 analyst EPS estimates -- and those estimates look like they're way too low, considering the company's massive Q1 earnings beat. The main reason for the weak stock performance is that investors are worried about rising competition in the West Coast-Hawaii market. United Continental (NASDAQ:UAL) added a slew of new flights to Hawaii in late December. United's Hawaii growth push -- along with Hawaiian's own growth and competitive responses by some other airlines -- drove a double-digit increase in industry capacity between the mainland and Hawaii. In Los Angeles and San Francisco (United's two West Coast hubs), industry capacity to Hawaii rose 17% and 25%, respectively, in the first two months of the year. It would have been reasonable to think that a surge in capacity during the weakest quarter of the year would undermine Hawaiian's unit revenue. Instead, RASM declined just slightly on Hawaiian Airlines' mainland routes, and this weakness was more than offset by strong RASM growth within Hawaii and on international routes. Thus, Hawaiian Airlines appears to have survived the onslaught from United Continental with no ill effects. This bodes well for its ability to fend off the coming challenge from Southwest Airlines, which will start flying to Hawaii in late 2018 or early 2019. Hawaiian Airlines expects RASM growth to slow to a range of 0% to 3% in the second quarter. This can largely be explained by the timing of Easter, which shifted some revenue into the first quarter. The carrier will also face larger headwinds from rising fuel prices and from non-fuel unit costs than it did in the first quarter. As a result, Hawaiian's pre-tax margin will probably fall by 6 to 7 percentage points. That will still leave it in double-digit territory. Furthermore, a combination of revenue growth, stock buybacks, and tax savings will offset most of the EPS pressure from a lower pre-tax margin. Finally, industry capacity trends are set to become more favorable in the second half of 2018, while non-fuel unit cost growth is expected to be near zero. This could drive strong EPS growth in the back half of the year, supporting a potential rally in Hawaiian Holdings stock.